Poll after poll indicates that the Labour party faces a blood bath in Scotland that could result in the loss of as many as 40 of its 41 Scottish seats and thus making a Labour majority government impossible, that coupled with the Liberal Democrats national meltdown could result in the SNP increasing their seats tally from the current 6 to as many as 57 thus replacing the Liberal Democrats as Britain's third largest party. 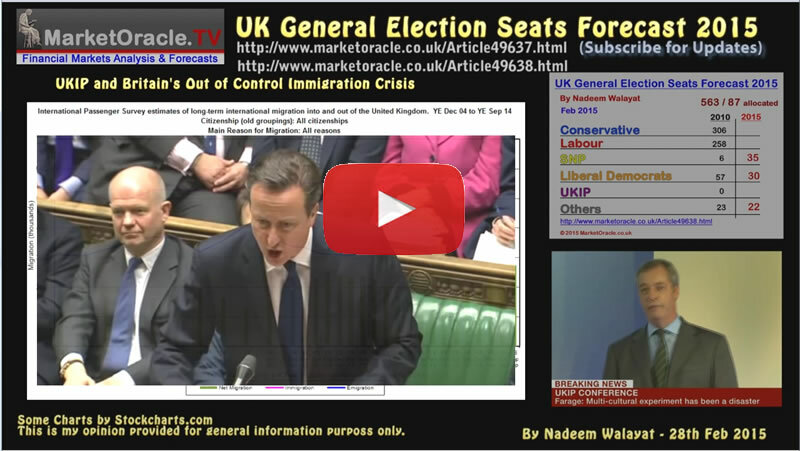 May2015.Com - Latest Polls analysis as of 5th March 2015. The number crunching results are the political equivalent of the UK being nuked, and that without Trident! Which would be immediately scrapped as a pre-condition for SNP support and with it some 10,000 Scottish jobs. The current polls and resulting seats projections if became manifest would result in the direst of outcomes for the UK in terms of a Labour Coalition with an effective Syrizia-esk I.S. entity north of the border whose primary objective is just as fanatically as that of the other I.S. we often hear much about in the media i.e. to DESTROY the United Kingdom. Which having failed to do so last September at the ballot box, now I.S. has its eyes on destroying the UK from within the carcass of an inept Milliband led Labour-SNP Government. An post election coalition permutation that is not even being seriously considered today would be one of keeping the highly destructive nationalists out of power at all costs even to the extent of Labour and Conservatives thinking the unthinkable by forming a grand coalition or more likely arrangement! Yes such a government would be chaotic and probably not last no more than a couple of years, but still it would be better than the destruction to the UK that the SNP would wrought. So Labour and Conservative MP's could as they did last September in Scotland swallow their ideological differences in defence of the union. Yes at this point in time such an outcome is highly improbable, nearly as improbable as a Con-Lib coalition was in 2010, but the important point is that it is POSSIBLE! Such an outcome would likely send the SNP fanatics into a frenzy of making frothing at the mouth demands of this, that and the other, but all the politicians at Westminister would need to do is turn the volume off for the SNP's MP's tally would be near worthless against the overwhelming 550+ MP tally of the Con Lab government. In terms of that which I consider the most probable, a vote for Labour is a vote for a Lab-SNP catastrophe in the event of which would only be avoided by means of an Con-Lab grand coalition of sorts or a very weak minority government just lingering on for a year or so with little power to get much through Westminister. Therefore the only logical answer is for those in Scotland that oppose continuing SNP Independence fanaticism despite losing the referendum by a clear margin, to vote tactically for either Labour, Conservative or even Liberal Democrat, whomever has the electoral advantage against the SNP in an particular seat so as to limit the number of SNP seats to a far less destructive 30-35.